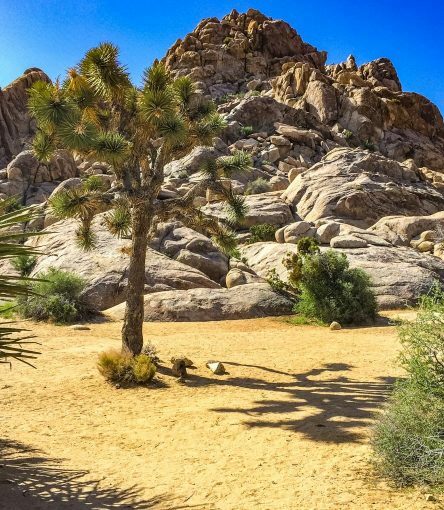 Escape for a weekend on a Joshua Tree National Park hiking trip. Spend a few days exploring an otherworldly desert landscape and discover the best hikes in Joshua Tree. 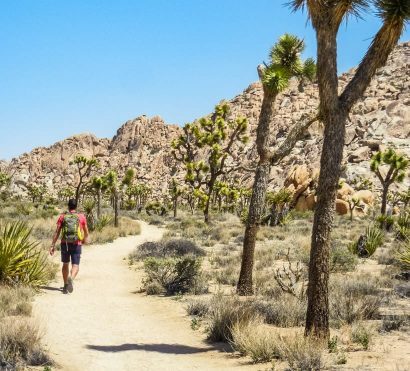 Expert guides lead you on daily hikes in the Mojave Desert region of the park where you see endless hills of granite boulders and forests of eerie Joshua trees. At the end of each day, appreciate a breathtaking desert sunset while relaxing at a comfortable basecamp in one of the national park campgrounds. Spend evenings enjoying delicious guide-prepared meals and the company of new friends over games and campfire. If you felt the “wow” factor during the day, just wait till you see the park at night! You’ll experience the park’s true ambiance at dusk when the Joshua Trees look their spookiest. Take in the star-filled desert sky each night and explore this unearthly desert forest while the sun shines overhead each day. At the weekend’s end we’ll reluctantly join the real world again but never forget our extraordinary desert adventure. 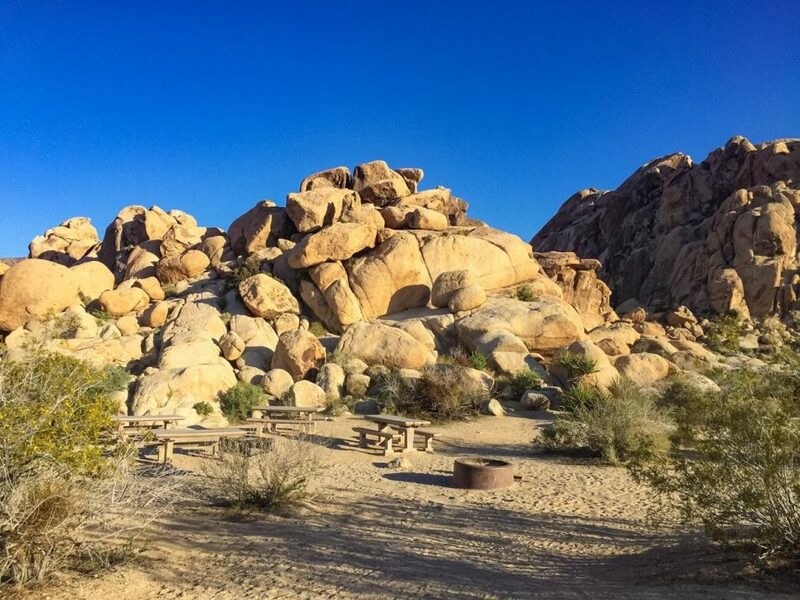 Spend a weekend hiking and camping among the wonderland of rocks in Joshua Tree National Park! 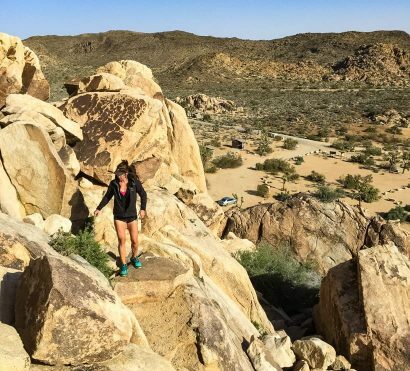 Hikers, climbers, photographers, and campers are drawn from all over the world to play in this park’s unique boulder outcroppings and Joshua Tree forests. 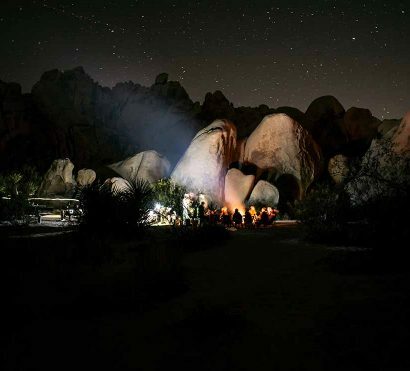 Its prime location in the high and exposed Mojave Desert create the perfect weather to hike and boulder hop all day and sleep outside the tent to witness unforgettable star shows each night. Each day you’ll wake up to incredible sunrises, enjoy fresh meals prepared by the guides, and get to know what makes Joshua Tree so unique through guided hikes and interpretation. Trip Start: Meets at Courtyard Marriott Palm Springs, CA, at 11am on Day 1. Trip End: Ends at Courtyard Marriott Palm Springs, CA, between 3-5pm on Day 3. 11:00am – Today we meet at our Host Hotel in Palm Springs at 11am. After introductions, we’ll hit the road for J-Tree! Our first hiking trail of the trip will take us to the top of one of the tallest points in the park, Ryan Mountain. This out and back hike climbs over 1,000 feet from the desert floor to a summit that provides panoramic views of the heart of Joshua Tree. 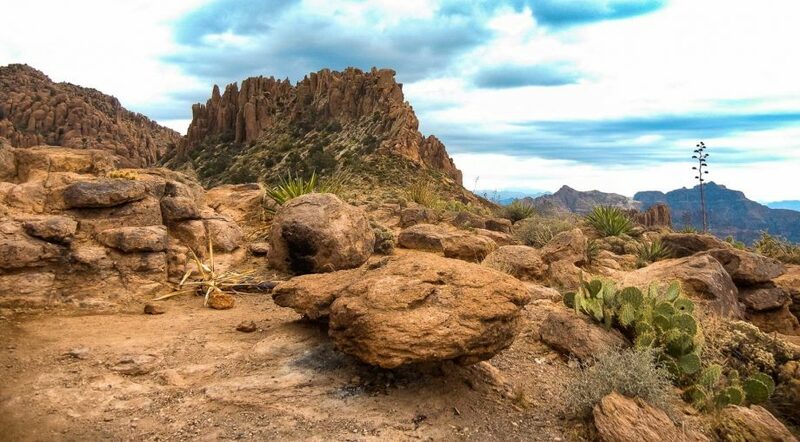 Many agree this rewarding hike offers one of the best views in the park! After our hike, we’ll head to our campsite which is nestled among towering rock formations that will serve as our playground! We’ll enjoy some time scrambling on rocks before a hearty hot dinner prepared by your guide, followed a crackling campfire. You’ll wake up in the middle of the desert to the smell of coffee and a mouthwatering breakfast prepared by your guide. After we fuel up, we’ll head out on our first hike to Willow Hole. This hike brings us up-close to The Wonderland of Rocks (a maze of dry washes and massive granite formations). The intricate washes of this area can easily confuse hikers, today you’ll see first hand the benefit of having a hiking guide in Joshua tree. We’ll explore with an optional scramble adventure to Oh-Bay-Yo-Yo, a hidden cave from the early 1900’s rumored to have been built by a group of local teens. This evening we’ll head to Key’s View to enjoy one of the best sunset views in the park. After taking in the spectacular view, we’ll head back to camp for another delicious guide-prepared meal. We’ll spend our last night together enjoying the dark night skies that granted Joshua Tree its status as an International Dark Sky Park. After breakfast, we’ll break camp and head out on our last adventure together. Today’s hike will allow us to experience the past and present of the area. We will see Wall Street Mill, the best-preserved gold stamp mill in the region, and Wonderland Ranch (sometimes referred to as Ohlson House, or Uncle Willie’s Health Food Store. ), all part of the colorful prospecting history of the area. Today Joshua Tree National Park is known as a premier destination for rock climbing and people travel from around the world to experience over 8,000 climbing routes. Leaving history (and the hiking crowds behind), we’ll head to the Astro Domes to watch some climbers in action! The South Astro Dome is one of the largest granite formations in the park and is an incredible sight to climbers and non-climbers alike. After our journey through time, we’ll back to the trailhead and depart for the Joshua Tree Saloon for our final lunch together before returning to Palm Springs where we’ll say our goodbyes until our next adventure together that is! Electricity: While camping at Joshua Tree National Park, you will only have electrical outlets in the public restrooms at the campground. Bring a portable phone charger so you’re not reliant on this power source. Cell Service: Cell service is quite limited at Joshua Tree. You should expect to be unreachable for the duration of this trip. Running Water: There is no running water anywhere in Joshua Tree National Park. We will bring all the water we need into the park with us. Joshua Tree is at a high elevation, which adds an extra measure of challenge to the hikes we do on this camping trip. 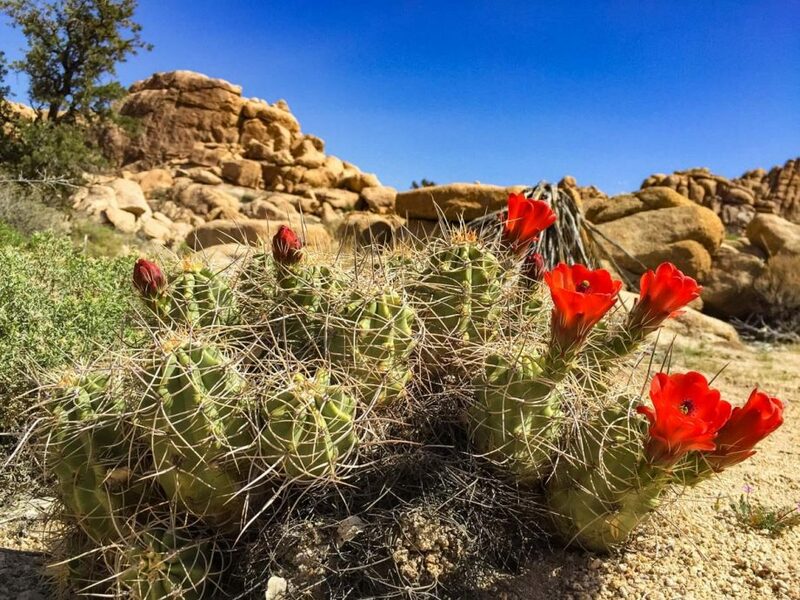 The high elevation, desert sun, and dry air will really dry out your skin and can crack your lips, be sure to bring sunscreen and lip balm and stay hydrated while hiking in Joshua Tree. The temperatures can swing from extreme hot to extreme cold in the Mojave Desert, so it’s important you check the weather forecast and prepare properly for this camping trip. We will be staying at a public National Park campground on this trip and we will have other travelers camping nearby.